Yesterday, the USD/JPY pair decreased due to an unexpected slowdown in the growth of the US Producer Price Index ex Food & Energy. The index increased by 2.3% YoY against the forecast of 2.7%. Today, after Domestic Corporate Goods Price Index release in Japan, the instrument has restored. The growth of the index, which assesses the change in the price level for goods purchased by Japanese corporations, was 3.0% against the forecast of 3.1%, negatively affecting JPY. On Thursday, the traders will focus on Consumer Price Index Ex Food & Energy release at 14:30 (GMT+2) and Initial Jobless Claims publication at 14:30 (GMT+2) in the USA. The market predicts high volatility. 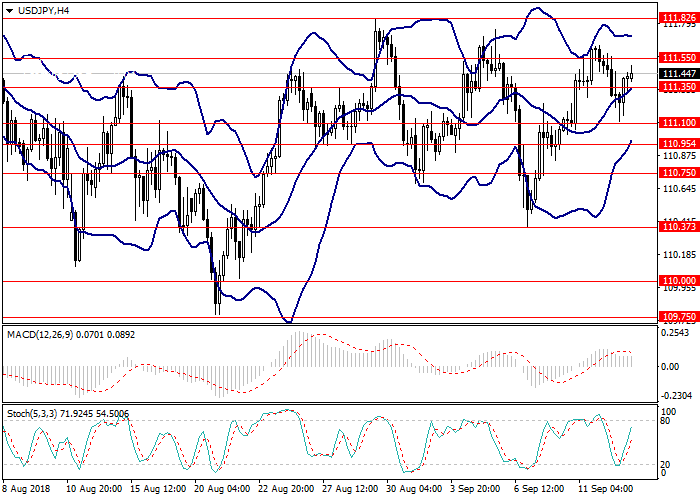 On the 4-hour chart, the pair moves sideways within the corridor formed by the upper border and the midline of Bollinger bands, the price range is narrowing. MACD histogram is in the positive area, keeping the signal to open long positions. Resistance levels: 111.55, 111.82, 112.00, 112.15, 112.60, 113.20. Support levels: 111.35, 111.10, 110.95, 110.75, 110.37, 110.00. Long positions can be opened from the current level with the target at 112.15 and stop loss 111.10. Short positions can be opened at the level 110.90 with the target at 110.37 and stop loss 111.20.